Over 92% of all horses that are confined to a stall or engage in competition suffer from episodes of painful gas colic often associated with ulcers. Many of them exhibit lack of appetite, stall weaving, or crib biting. These stress factors undoubtedly hamper performance. Gut Protector is a dietary supplement that stimulates the immune response and acts as a very potent anti-stress factor. Gut Protector gets the job done. A healthy horse feels good and performs much better. 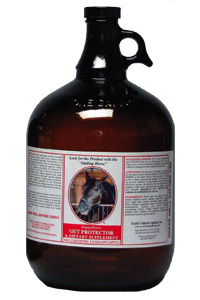 One gallon lasts the average horse slightly over two months. Administer in a dose syringe, or directly on feed. Ingredients: Water, aloe vera liquid, licorice extract, rhubarb extract, fructose, apple butter, apple juice, apple cider vinegar, astragulus extract, passion flower extract, cinnamon extract, bromeliad powder, maltodextrin, xanthum gum, myrrh, cherry concentrate, honey, highly purified solution of metallic silver colloids, with potassium sorbate and potassium benzoate (preservatives).